(6) The design internal moment M,Ed may be taken as the value at the point where the centreline of the brace member meets the face of the chord member. (7) For unreinforced joints, the design in-plane moment resistance and design out-of-plane moment resistance M,Rd should be obtained from Table 7.13 or Table 7.14 as appropriate. For reinforced joints see 7.5.2.2. (8) The special types of welded joints indicated in Table 7.15 and Table 7.16 should satisfy the appropriate design criteria specified for each type in that table. (1) Various types of joint reinforcement may be used. The appropriate type depends upon the failure mode that, in the absence of reinforcement, governs the design resistance of the joint. (2) Flange reinforcing plates may be used to increase the resistance of the joint to chord face failure, punching shear failure or brace failure with reduced effective width. (3) A pair of side plates may be used to reinforce a joint against chord side wall failure or chord shear failure. (4) In order to avoid partial overlapping of brace members in a K or N joint, the brace members may be welded to a vertical stiffener. (5) Any combinations of these types of joint reinforcement may also be used. (6) The grade of steel used for the reinforcement should not be lower than that of the chord member. 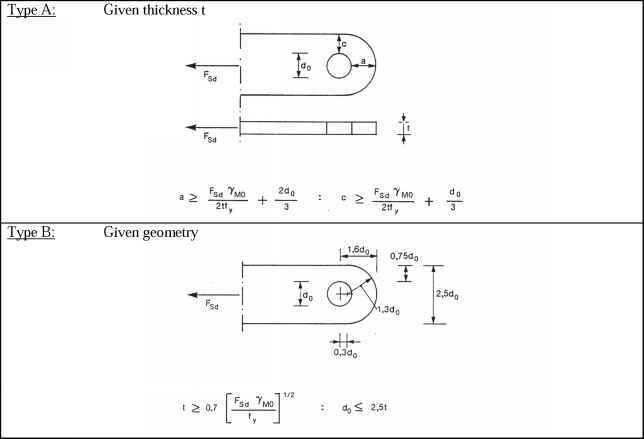 (7) The design resistances of reinforced joints should be determined using Table 7.17 and Table 7.18.